Hello, I hope your day is off to a good start! 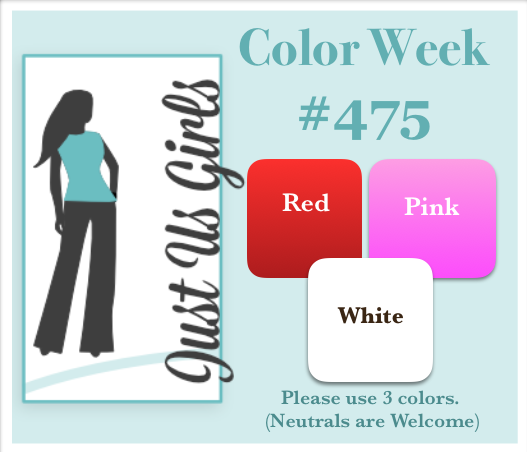 It’s Color Week at Just Us Girls and Maria has a happy color palette for you to try! I just want to clarify that my hibiscus are in fact a deep orange and not red as they appear to be. I used two different colors of orange for this card. They actually match my background paper nearly perfect in real life. 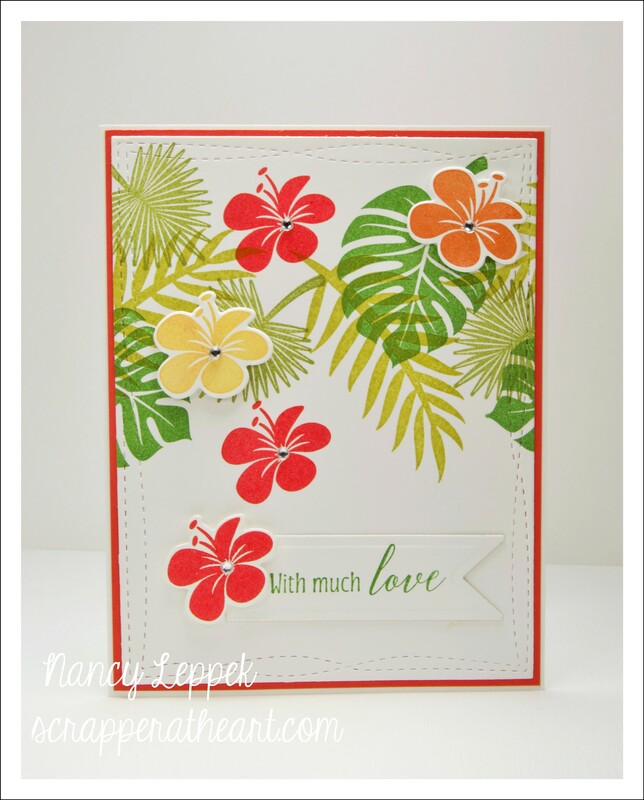 I really love this set from Stampin Up called Tropical Chic, it always stamps so well and never disappoints! Categories: Cards | Tags: Card making, Cards, rubber stamps, stamping, Stamping Up, Thinking of you | Permalink. Hello, Hope you are having a great day! 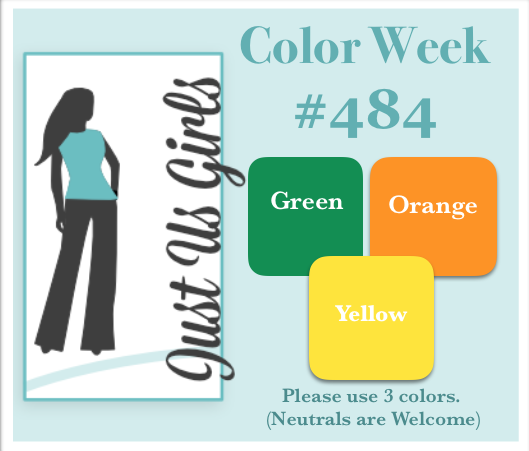 Angie is our hostess this week at Just Us Girls and she came up with a very fun and unique Trend Challenge for us this week. It’s called off the edge. I wish I would have thought of it! Great job Angie! My SU flowers were made out of alcohol inks, the leaves are a SU punch, tag is Verve, and the sentiment is from SSS. I am pretty happy with the way this card came together and so quickly at that. As you can tell, I cut down my card base a bit so that my tag could hang off the edge. 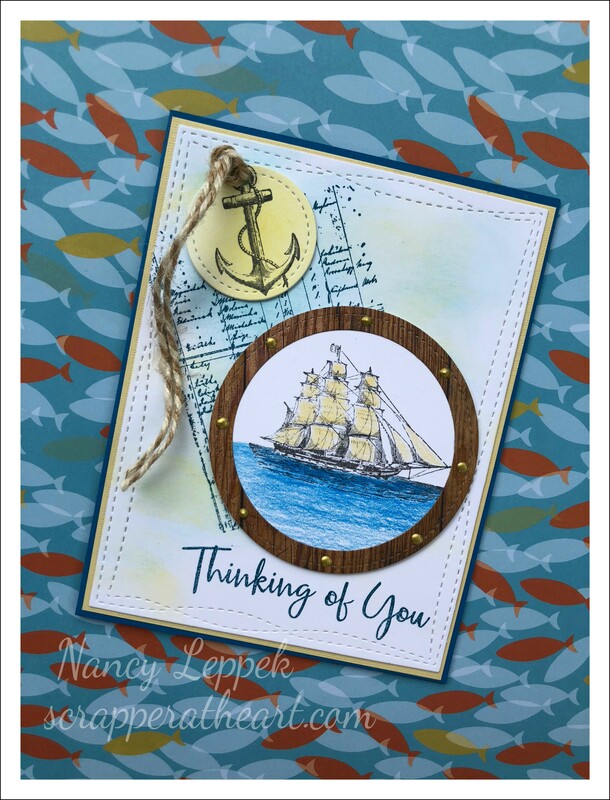 Categories: Cards | Tags: Card making, Cards, rubber stamps, sketch challenge, stamping, Stamping Up, Thinking of you | Permalink. 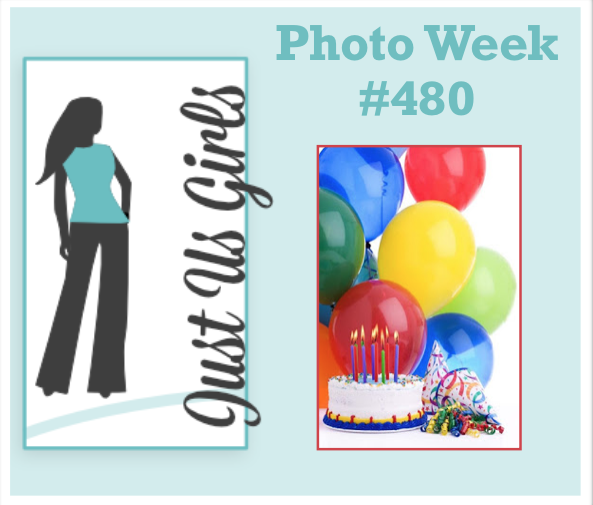 Hello, We have a great celebratory photo this week at Just Us Girls and I decided to step out of the box and get inspired by colors instead. The blue and green balloons spoke to me initially when I saw this photo and I thought water, then as I thought a bit harder I thought beach ball colors…and Whalla….the card was born! LOL. Not sure how to spell Whalla. Hopefully, you get the gest! Everything you see here is from MFT…besides some of the paper. I sponged the light blue and colored her with Prismas. Categories: Cards | Tags: Card making, Cards, my favorite things, rubber stamps, stamping, Thinking of you | Permalink. Today’s card is a mix of MFT and SU. I just adore these MFT elephants and it was time to get them out and play with them again. I did some emboss resist and didn’t worry too much about my ink blending and am rather happy with the results. The Ele, florals, and butterflies are MFT. The Ele was colored with Prismas and the sentiment is from SU. I sure hope you will consider coming over to JUGS and joining us this week! Who knows you may even become our Chic of the Week! 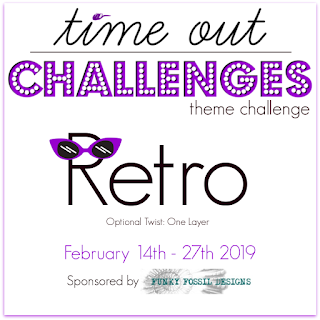 Categories: Cards | Tags: Card making, Cards, color challenge, miss you, my favorite things, rubber stamps, stamping, Thinking of you | Permalink. 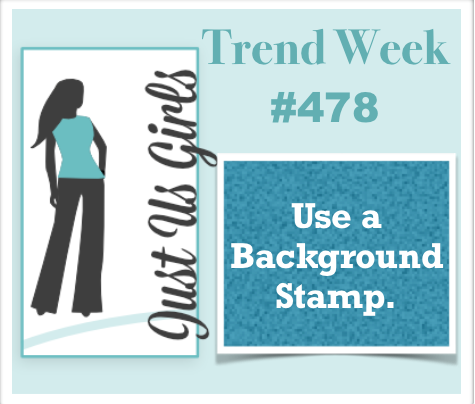 Hello, Today over at Just Us Girls we have a challenge to use a Background stamp somewhere on your card and or project. I decided to also make a background with a smaller leaf SU stamp (on the pink cardstock) and then used my script background stamp (on my green piece of cardstock). I just love this stamp set from SU. It is one of my all-time favorite wooden block stamps that always seems to be my go too with great results. I colored the flowers with my Copics and a bit of colored pencil. I am still a work in progress that is for sure. The HUGS die from Lawn Fawn is cut from shiny silver cardstock. Categories: Cards | Tags: Card making, Cards, rubber stamps, Stamping Up, Thinking of you | Permalink. Here is a quick reference to my supplies: Bo Bunny DP, SU- Text You Later and Thoughtful Banners, telephone is from Papertrey Ink, the Paper die cut is from Paper Smooches. I so appreciate your visits as of late. 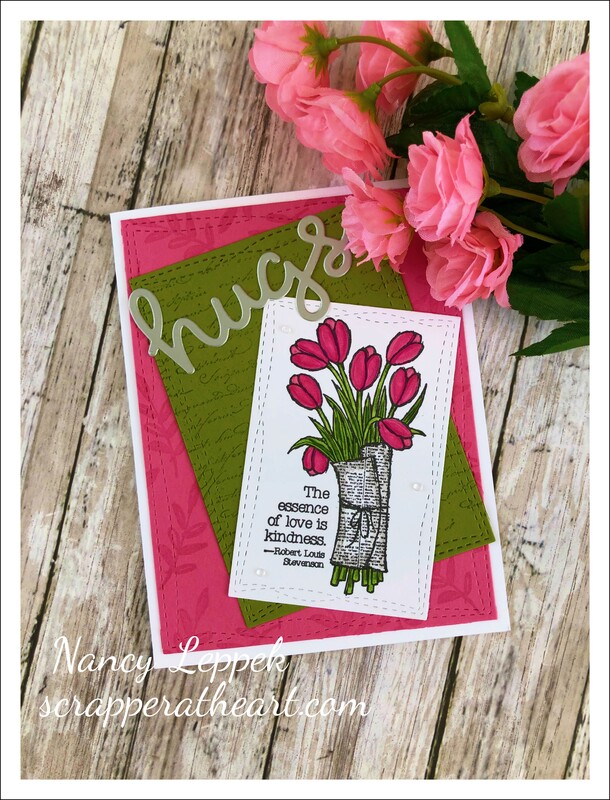 Categories: Cards | Tags: Card making, Cards, color challenge, encouragement, Papertrey Ink, rubber stamps, stamping, Stamping Up, Thinking of you | Permalink. Hello, Hope you are having a great day! 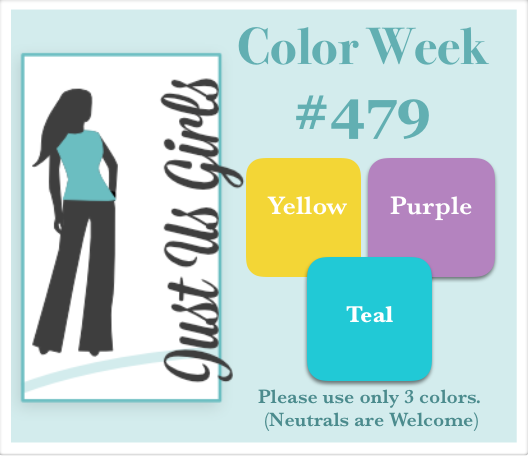 We have a fun Color Combo for you this week at Just Us Girls. Pink, Red and White! My card came together very quickly! I love this new set from SU…it’s called wishing You Well. The sentiment is also from SU and comes from the Colorful Season’s set. Both rectangles are MFT. Please come on over to JUGS and join us! We would love to have you! I really appreciate all of your visits and your sweet comments. 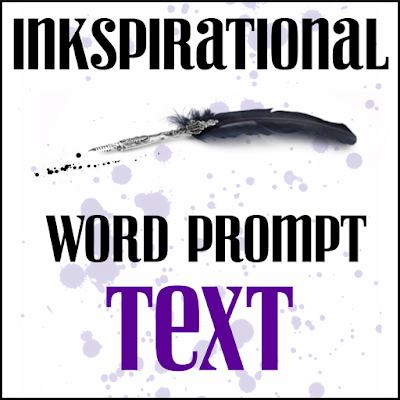 Categories: Cards | Tags: Card making, Cards, encouragement, friendship, rubber stamps, stamping, Stamping Up, Thinking of you | Permalink. 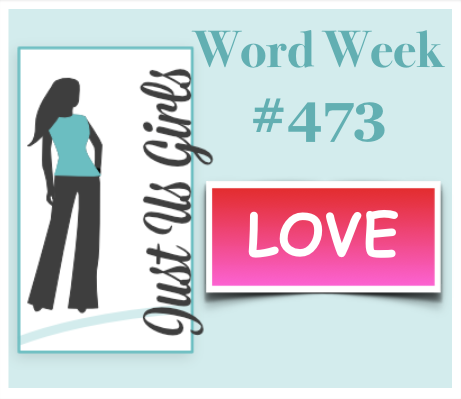 Hello there, Today over at Just Us Girls we have a new challenge starting and the word Ina has for us this week is LOVE! Easy huh? I stepped out of the box a bit and decided to do something that wasn’t red, which is the typical color we all think of when you hear that word. 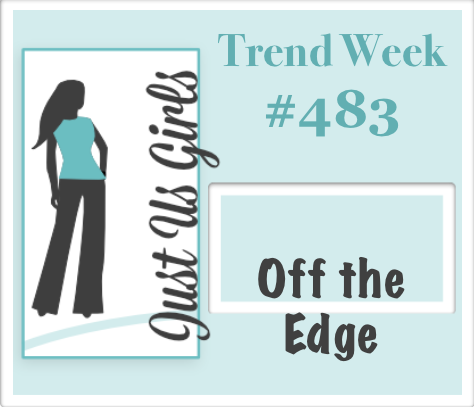 I also would like to welcome out guest designer…Lisa Elton, https://mypapertales.blogspot.com/. She will be with us all month! Welcome Lisa, we are thrilled you are joining us! 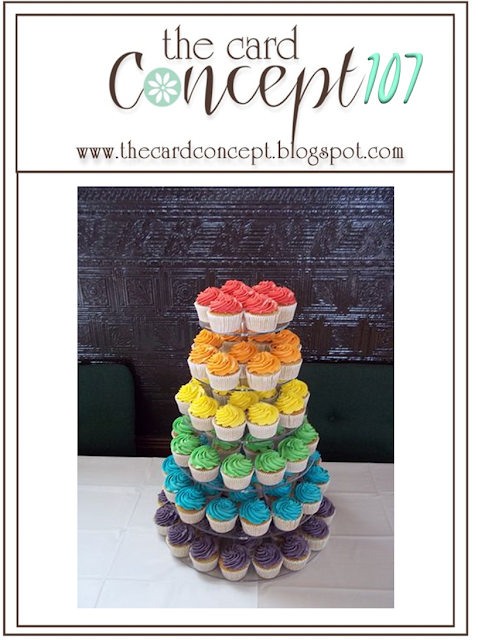 Here is a bit about my card! Flower is very dear to me and is from Verve! One of my first stamps I ever bought from Julee. The leaves are a punch from SU and then embossed for added texture. The flowers were colored using the smooshing technique and oxide inks. I think they came out great! 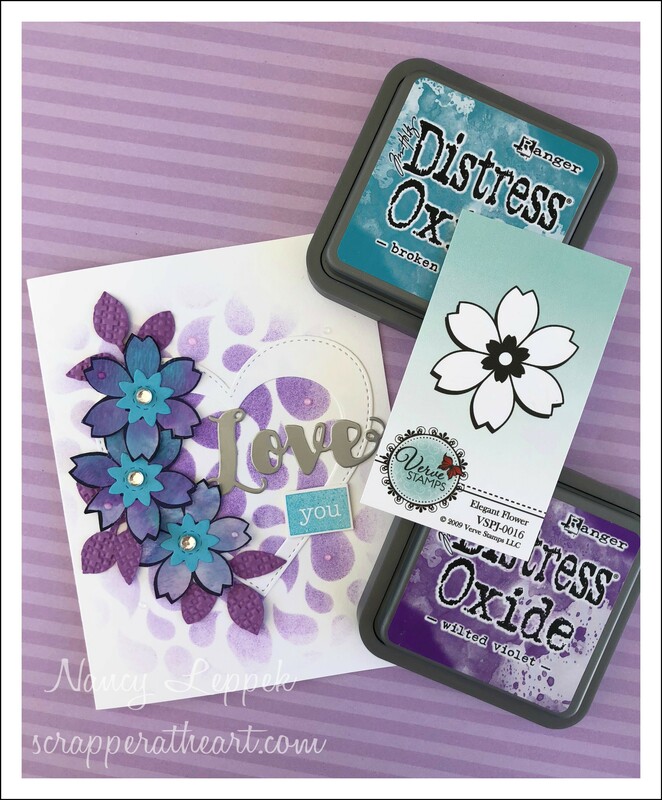 The heart die is from MFT, the love die is from Neat and Tangled and the you is Simon Says Stamps. The background was lightly stenciled. 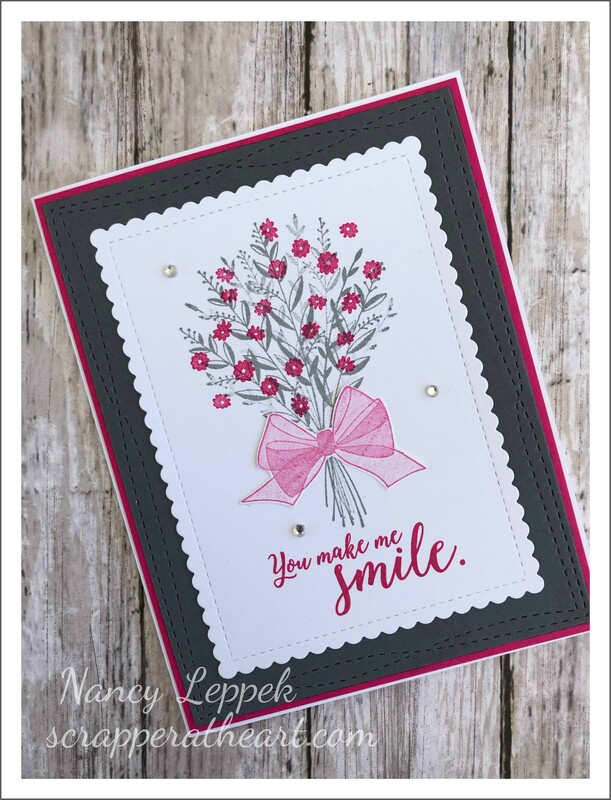 Categories: Cards | Tags: Card making, Cards, love, my favorite things, rubber stamps, stamping, Stamping Up, Thinking of you, Valentines Day, Verve Stamps | Permalink. Hello, Hope you are having a great day! Today’s card is for The Card Concept. I saw this technique for the background in a video, and for the life of me thought it was by Laura Fadora, and now I can’t find it. Anyways, if I figure it out I will edit this post, as I like to give credit where credit is due. I really had a fun time making it. The Hugs die is from Lawn Fawn, the heart die is SU, and the wonky rectangle is MFT. I used my oxide inks and sticky notes to achieve my rainbow effect. The HUGS is on sparkly silver paper from SU. I splattered the background with white and black paint. The card looks much better in real life! 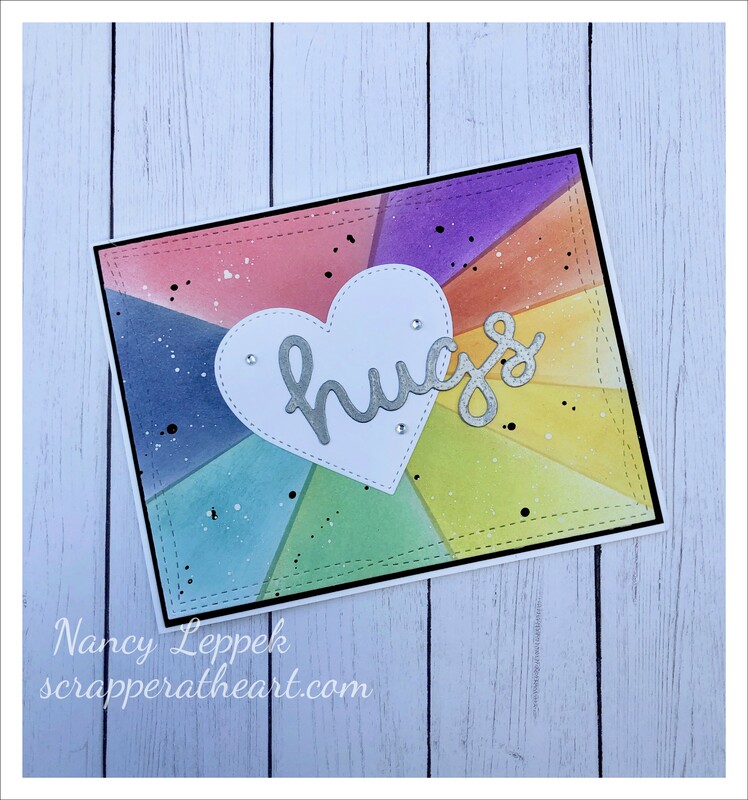 I am also going to link this card up over at Addicted to Stamps and More where it’s Anything Goes! I made this card for a dear friend’s daughter that is battling cancer for the second time. I had the pleasure of meeting her last summer. She is an amazing person and so strong and courageous. I hope she felt the love when she received it. 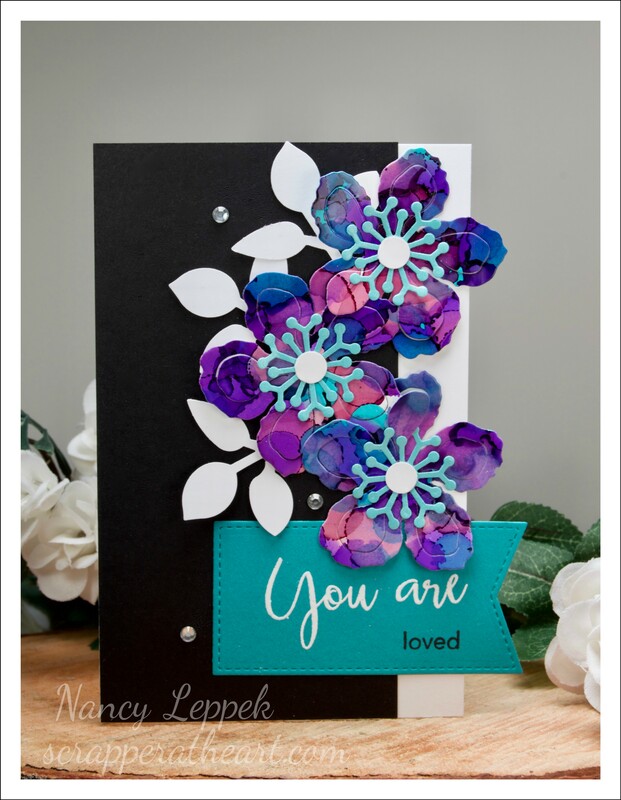 Categories: Cards | Tags: Card making, Cards, color challenge, die cuts, oxide inks, Sympathy card, Thinking of you | Permalink. 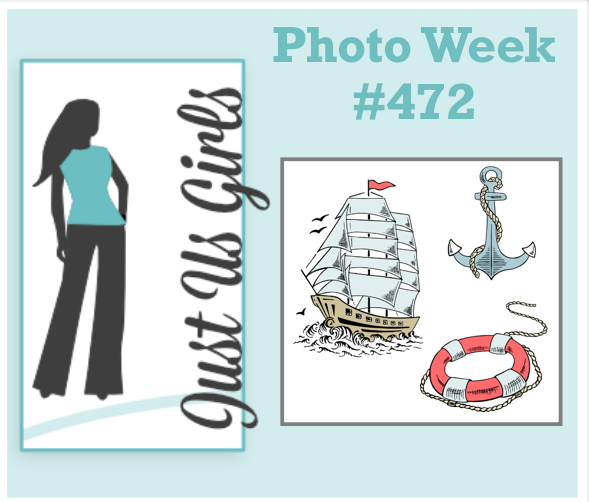 Hello, I am hosting this week at Just Us Girls and I have a nautical theme for you for Photo Week. I never make near enough masculine cards…do you? I struggle with them so much! I sponged the background softly with Oxide inks and used colored pencil for the water! The sentiment and stamps are from SU. Categories: Cards | Tags: Card making, Cards, colored pencils, encouragement, rubber stamps, stamping, Stamping Up, Thinking of you | Permalink.